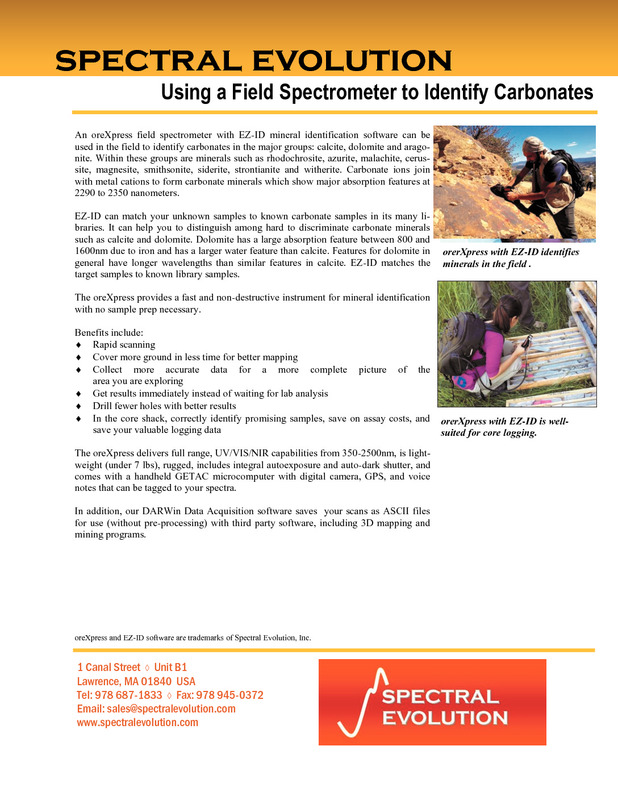 An oreXpress field spectrometer with EZ-ID mineral identification software can be used in the field to identify carbonates in the major groups: calcite, dolomite and aragonite. Within these groups are minerals such as rhodochrosite, azurite, malachite, cerussite, magnesite, smithsonite, siderite, strontianite and witherite. Carbonate ions join with metal cations to form carbonate minerals which show major absorption features at 2290 to 2350 nanometers. 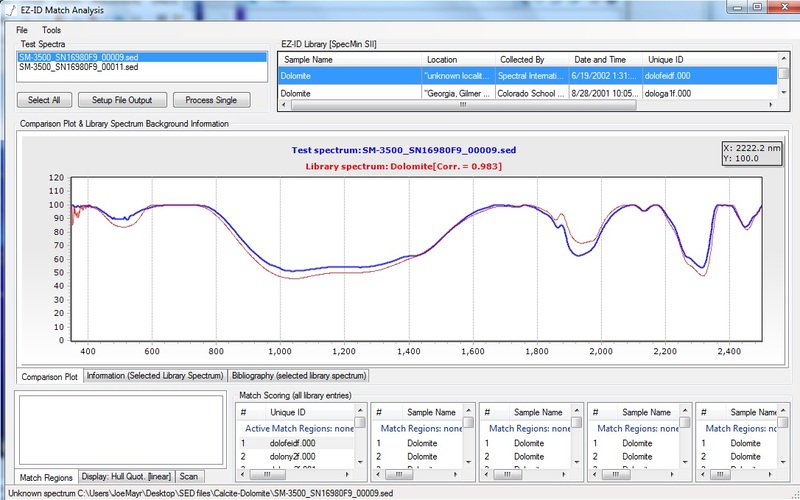 EZ-ID can match your unknown samples to known carbonate samples in its many libraries. It can help you to distinguish among hard to discriminate carbonate minerals such as calcite and dolomite. Dolomite has a large absorption feature between 800 and 1600nm due to iron and has a larger water feature than calcite. 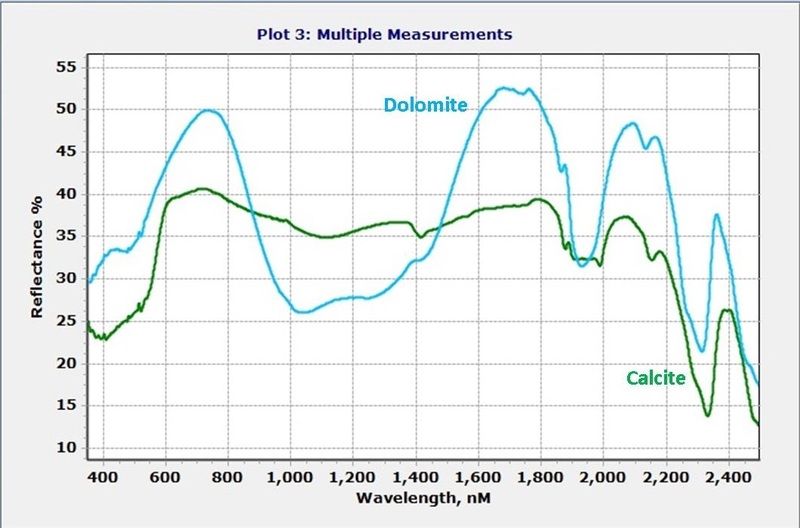 Features for dolomite in general have longer wavelengths than similar features in calcite. 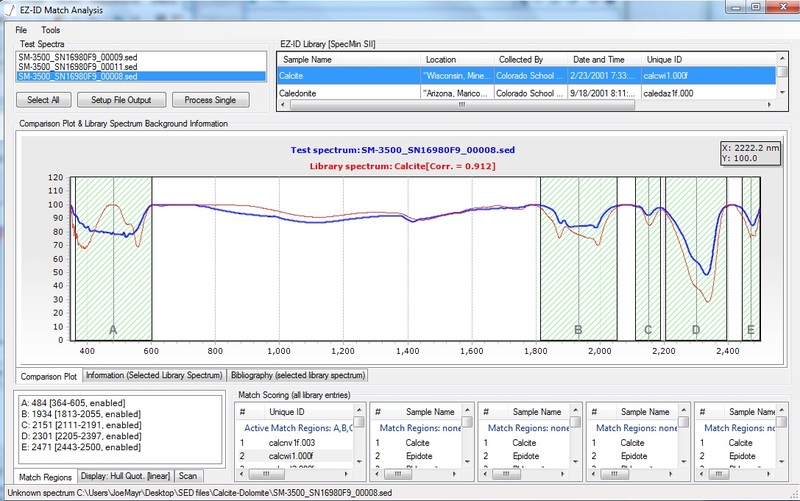 EZ-ID matches the target samples to known library samples. The oreXpress delivers full range, UV/VIS/NIR capabilities from 350-2500nm, is lightweight (under 7 lbs), rugged, includes integral autoexposure and auto-dark shutter, and comes with a handheld GETAC microcomputer with digital camera, GPS, and voice notes that can be tagged to your spectra. In addition, our DARWin Data Acquisition software saves your scans as ASCII files for use (without pre-processing) with third party software, including 3D mapping and mining programs. Comparing calcite and dolomites spectra in DARWin SP Data Acquisition software multi-plot scan. Calcite spectra identified by EZ-ID by comparing to three spectral libraries. Dolomite spectra identified by EZ-ID.